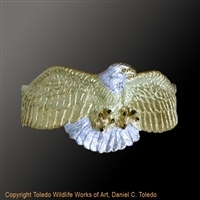 BALD EAGLE BRACELET "AMERICA'S PRIDE"
BALD EAGLE PENDANT "STATELY ONE"
Details: In "Stately One" Bald Eagle Pendant, Daniel C. Toledo captures the essence of the bald eagle's spirit using rhodium and 22k gold plated over sterling silver, artistically applying black enamel and skillfully sets a yellow sapphire for the eye. Included in the price is a beautiful jewelry box, a black leather cord (18"), a certificate of authenticity, and free shipping via USPS Priority Mail Insured to any address in the United States. Please contact us for shipping quotes to addresses outside of the United States. Cheetah bracelet "Amanda's Cheetah" is made of rhodium and 22k gold plated over sterling silver, black enamel, and citrine for the eyes. 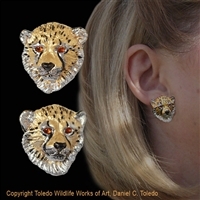 CHEETAH CUB EARRINGS "GLORIA'S CUTIES"
ARABIAN HORSE PENDANT "DESERT WIND"
Inspired to capture the beauty of the elegant Arabian, Daniel Toledo strives to convey the animal's strength too in his pendant "Desert Wind". Available in two colorings - gold version and black version. Included in the price is a beautiful jewelry box, a black leather cord (18"), a certificate of authenticity, and free shipping via USPS Priority Mail Insured to any address in the United States. Please contact us for shipping quotes to addresses outside of the United States. Dimensions: approximately 1.94" x 1.75"
ARABIAN HORSE PENDANT "Wind Dancer"
"Wind Dancer" Arabian Horse Pendant is part of our Nature's Finest Collection. Created in rhodium, 22k, and 24k gold plated over sterling silver using citrine for the eye makes this piece tarnish resistant and hypoallergenic. An edition of 250, each piece is signed and numbered, comes with a certificate of authenticity as well as a black leather cord (18"). 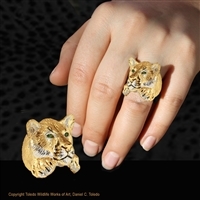 "Royal Bengal" (tiger ring with paws) is part of our Nature's Finest Collection. Created in rhodium, 22k, and 24k gold plated over sterling silver, applying black enamel and using peridot or tourmaline for the eyes makes this piece tarnish resistant and hypoallergenic. An edition of 250, each piece is signed and numbered, comes with a certificate of authenticity and a beautiful box. 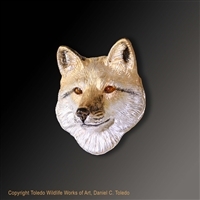 For more sizes, please contact us at toledowildlife@aol.com. 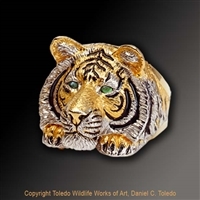 BENGAL TIGER PENDANT "I AM TIGER"
Capturing the beauty of the beast, Daniel C. Toledo's creations utilize the finest treasured materials on earth releasing the soul and nature of our animal kingdom in wearable works of art. 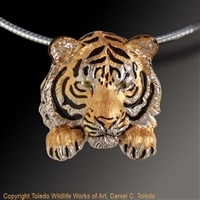 "Bengal Mystique" Tiger Pendant is part of our Nature's Finest Collection. Created in rhodium, 22k, and 24k gold plated over sterling silver, applying black enamel and using peridot for the eyes makes this piece tarnish resistant and hypoallergenic. An edition of 250, each piece is signed and numbered, comes with a certificate of authenticity as well as a black leather cord (18"). 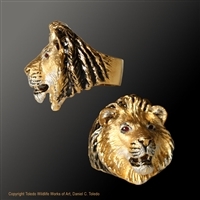 TIGER EARRINGS "A ROYAL PAIR"
TIGER BRACELET "CAT IN THE GRASS"
LION RING "SON OF SIMBA"
"Son of Simba" Lion Ring is part of our Nature's Finest Collection. Rhodium and 22k gold plated over sterling silver, black enamel, and peridot for the eyes. It is tarnish resistant and hypoallergenic. An edition of 250, each piece is signed and numbered, comes with a certificate of authenticity, and is beautifully boxed. 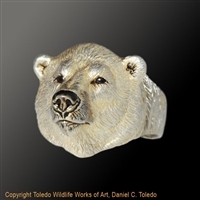 LION RING "PRIDE OF SIMBA"
POLAR BEAR RING "CONQUEROR OF THE NORTH II"
Each piece is handcrafted by the artist Daniel C. Toledo to ensure the quality is the same if not better. Included in the price is a beautiful jewelry box, a certificate of authenticity, and free shipping via USPS Priority Mail Insured to any address in the United States. Please contact us for shipping quotes to addresses outside of the United States. GRIZZLY BEAR PENDANT "TERRY'S BEAR"
Dimensions: approximately 1.62" x 1.62"
Details: When I was commissioned to create this piece, the customer requested for it to be called "Terry's Bear" after his girlfriend who loves grizzlies. Each piece is handcrafted by the artist Daniel C. Toledo to ensure the quality is the same if not better. Included in the price is a beautiful jewelry box, a black leather cord (18"), a certificate of authenticity, and free shipping via USPS Priority Mail Insured to any address in the United States. Please contact us for shipping quotes to addresses outside of the United States. Secretive and solitary in nature, the cougar roams throughout North and South America, living among us in the shadows. Inspired to capture the beauty and vulnerability of the cougar in a distinctively original pose Daniel Toledo created "Shadow Cat". Using natural elements of rhodium and 22k gold plating to convey the cougar's coloring with beautiful peridot gemstones for the eyes the cougar comes alive. "Shadow Cat" Cougar Pendant arrives at your doorstep in a beautiful jewelry box with a black leather cord (18") and a certificate of authenticity. Please contact us for shipping quotes to addresses outside of the United States. DOLPHIN PENDANT "ANGEL IN MOTION"
Details: "Angel in Motion" is handcrafted by the artist Daniel C. Toledo ensuring quality. We include a beautiful jewelry box, a black leather cord (18"), a certificate of authenticity, and free shipping via USPS Priority Mail Insured to any address in the United States. Please contact us for shipping quotes to addresses outside of the United States. The African elephant is a symbol of both strength and compassion and evident in "Masai Monarch" African Elephant Pendant you see and feel those characteristics. Daniel Toledo's knowledge of this great animal and his artistic ability is realized in great detail in "Masai Monarch". His special talent of expressing as much detail possible in his work is a signature trademark. Then using earth's precious materials he ensures a long life for your collectible pendant. We include a beautiful jewelry box, a black leather cord (18"), a certificate of authenticity, and free shipping via USPS Priority Mail Insured to any address in the United States. Please contact us for shipping quotes to addresses outside of the United States. ELEPHANT PENDANT "LORD OF THE PLAINS"
Did you know that the elephant can live up to 70 years? 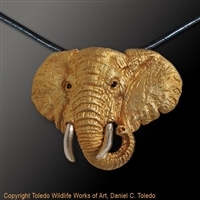 And, so too and even longer can "Lord of the Plains" African Elephant Pendant. 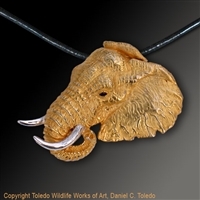 Entirely created by artist, Daniel C. Toledo, whose artistic ability captures in masterful detail the African elephant, makes each piece a work of art. 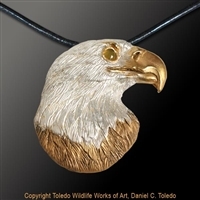 This talent of expressing as much detail possible in his work is a signature trademark of Dan's and then using earth's precious materials he ensures a long life for your collectible pendant. We include a beautiful jewelry box, a black leather cord (18"), a certificate of authenticity, and free shipping via USPS Priority Mail Insured to any address in the United States. Please contact us for shipping quotes to addresses outside of the United States. 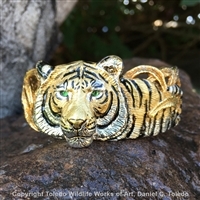 Dimensions: approximately 1.5" x 1.5"
Details: "Handsome Howler" is distinctively handcrafted by the artist Daniel C. Toledo to ensure the quality is the same if not better. He cleans the waxes and the castings, applies the enamel and sets the eyes ensuring that you will receive exactly what is pictured. Included in the price is a beautiful jewelry box, a black leather cord (18"), a certificate of authenticity, and free shipping via USPS Priority Mail Insured to any address in the United States. Please contact us for shipping quotes to addresses outside of the United States. "Foxie" Fox Pendant is part of our Nature's Finest Collection. Created in rhodium, 22k, and 24k gold plated over sterling silver, applying black enamel and using citrine for the eyes makes this piece tarnish resistant and hypoallergenic. Included in the price is a beautiful jewelry box, a black leather cord (18"), a certificate of authenticity, and free shipping via USPS Priority Mail Insured to any address in the United States. Please contact us for shipping quotes to addresses outside of the United States. 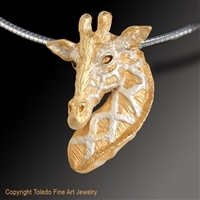 Details: "Elegant One" is handcrafted by wildlife artist and jeweler Daniel C. Toledo and captures the true essence of the magnificent giraffe. Daniel Toledo details the waxes and the castings, artistically applies the enamel and sets the eyes ensuring that you will receive exactly what is pictured. Included in the price is a beautiful jewelry box, a black leather cord (18"), a certificate of authenticity, and free shipping via USPS Priority Mail Insured to any address in the United States. Please contact us for shipping quotes to addresses outside of the United States. Materials: Rhodium and 22k gold plated over sterling silver, citrine. 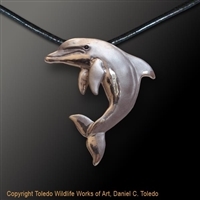 DOLPHIN PENDANT "ANGEL OF THE SEA"
Details: Daniel C. Toledo's knowledge of wildlife anatomy captures in metal the lifelike beauty of the dolphin. 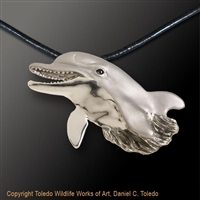 Every detail including the dolphin's teeth and coloring is present in this beautiful piece. We include in the price a beautiful jewelry box, a black leather cord (18"), a certificate of authenticity, and free shipping via USPS Priority Mail Insured to any address in the United States. Please contact us for shipping quotes to addresses outside of the United States. 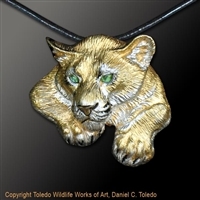 "Kalahari Queen" Lioness Pendant is part of our Nature's Finest Collection. Rhodium, 22k, and 24k gold plated over sterling silver, applying black enamel, and peridots for the eyes makes this piece tarnish resistant and , hypoallergenic. An edition of 250, each piece is signed and numbered by me, comes with a certificate of authenticity as well as a black leather cord (18"). The black-maned lion is the most sought after of the color phases of the lion species. To see one in the wild is life changing and unforgettable. Daniel Toledo brings to life in "Daniel's Lion" the majesty of the black-maned lion in a timeless and highly collectible pendant. Experience and make it yours forever. LEOPARD EARRINGS "KOPJE CATS TOO"